There had been, for some years in Glasgow, consideration given to establishing an informal forum for ex-members of The Boys’ Brigade in the form of a “Stedfast Association”, but for a variety of reasons it never materialised. A wide group of local Associations operate throughout the United Kingdom and Republic of Ireland at Battalion and District level and strangely Glasgow - the city of The Brigade’s birth - did not have an Association. However at an exploratory meeting on 25 November 2008, attended by interested ex-members, it was enthusiastically and unanimously agreed to establish an association here in Glasgow. The general aims of a Stedfast Association are: To further the aims and object of The Boys’ Brigade, through a spirit of friendship among past and present members, sharing information on the present work at home and overseas, in addition to promoting the continuing effective work of the organisation to the general public. Local Associations are self motivating and the schedule of meetings, governance and nature of programme varies widely, in meeting the requirements of the membership. It is essentially a meeting point for ex-members who wish to retain contact and maintain a supportive interest in The Boys’ Brigade of the present. Glasgow Battalion of The Boys' Brigade was pleased to note that at a meeting of interested people on Tuesday 25 November 2008 it was agreed to establish a Glasgow Stedfast Association. This is a social and supportive network for ex-members and supporters of the movement. The Association is run independent of The Boys' Brigade and the Battalion, but will maintain links with Glasgow Battalion. John Neil OBE the Boys' Brigade Glasgow Battalion Secretary, was invited to be Patron. The Association welcomes new members. An application form can be downloaded from The Boys' Brigade, Glasgow Battalion website. Webmaister March 2010 : as a young fledgling BB Officer in Bridgeton, Glasgow's east-end, in the early 1970s, I met Bill Livingston. Bill was District Convenor of the then Dennistoun District and led by example giving everyone around him much encouragement. He certainly encouraged me and gave me a lot of help as I strived year on year to keep the company band going. To be honest I thought Bill was dead! How wonderful to find out he is not only alive and kicking but still working for The Boys' Brigade. In Glasgow during my time these words went side by side, 'BB Bands & John Cooper'. John ran the Glasgow Battalion Brass Band for many many years but also used his talents and enthusiasm to encourage all BB bands. I was very fortunate to be introduced to John as he was raising the profile of BB Bands and I'm sure due to his influence my BB band took part in Glasgow Battalion shows and events. Both stalwarts and BB men through and through..... a pleasure knowing both of them. 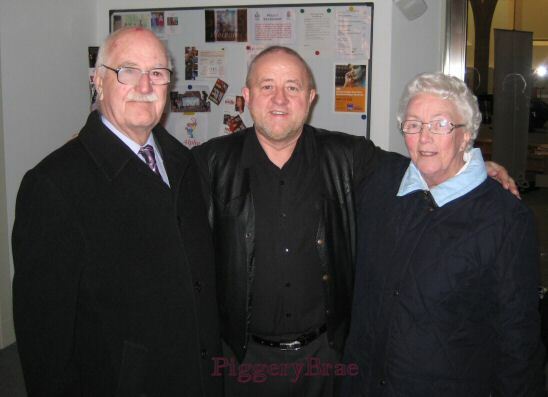 Webmaister Nov. 2010 delighted to meet up with Bill, his wife Mary and John Cooper at a PiggeryBrae concert in aid of funds for the Stedfast Association held in Cathcart Trinity Church. Bill Livingston and his wife Mary with yer Webmaister! Aye fantastic to meet up with Bill again after all these years.... a BB legend! I was delighted to receive this honour. The Stedfast Movement was formed in 1983, the Centenary Year of The Boys' Brigade; although several very successful associations had been in existence well before then - and these continue to this day. In September 2002, representatives of thirteen Stedfast Associations met at Felden Lodge, the Headquarters of the BB, and formed the Federation of Stedfast Associations: United Kingdom and Republic of Ireland. Stedfast Associations are closely associated with The Boys' Brigade, founded in Glasgow, Scotland, in 1883 by Sir William Smith. They exist in various locations in different parts of the world as a means by which former members (Officers and Boys) of the Brigade, their wives or husbands, and friends/current members of the movement can have a means of social contact with each other. At the same time, there is the opportunity to keep in touch with what is happening in the Brigade, and often to provide informal assistance & maintain links to the local units (Companies or Battalions) of the Brigade. The Federation of Stedfast Associations: United Kingdom and Republic of Ireland exists to unite and promote Stedfast Associations throughout the United Kingdom and Republic of Ireland. The Federation is currently searching out areas where groups of former members are meeting, with a view to encouraging them to become members of the Federation. Membership of the Federation for an Association is not obligatory. However, the Stedfast Association likes to invite Stedfast Associations and Old Boys Associations to become members of the Federation in order that they can make contact with the wider Stedfast family. Former BB members who are not members of an Association are encouraged to contact the Federation so that we can try to put them in touch with their nearest Association. Stedfast Associations are organisations for Past Members, (Old Boys & Ex-Officers), along with serving Officers, Friends and Supporters of The Boys' Brigade.